In astrology, Mercury reigns over communications and technology, and when its motion appears to go backward in the sky, it causes all sorts of problems. Eponymous 4’s Greg Bueno worked in both areas, first as a content editor and then as an application developer. So he’s become incredibly wary when Mercury goes into retrograde. 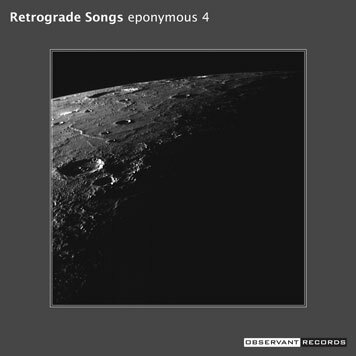 Mercury Retrograde is also a time for past issues to resurface, and Greg noticed he tended to work on a set of songs that never fit on previous Eponymous 4 albums during such periods. He took that as a cue to collect these songs, but they were too stylistically diverse to make a proper album. So they would instead become b-sides to singles, then compiled into a collection. Retrograde Songs was born. Greg approached these songs in a manner similar to his work on A Ghost in My Shadow — he revised tracks to the point where they bore little to no resemblance to their original takes. Some songs that existed only as sketches were finally completed. In one album, Retrograde Songs epitomizes the breadth of the Eponymous 4 catalog.